WinVorbis & Vorbix are free graphical front-ends for VorbisComment, OggEnc, OggDec, & VorbisGain. I suggest you install vorbix in a new directory -- /usr/local/vorbix. Download vorbisgain from the link below if you intend to use the Replay Gain option. Most current Linux distributions install the Ogg Vorbis tools by default. Use the link below if you are missing them. Vorbix requires a customized version of the libqt libraries. Download the following file, extract to the same folder, and execute vorbix using the included startvorbix script which assumes /usr/local/vorbix. Some people are receiving an error when loading some ogg files. This has been tracked to some CD rippers placing MP3 ID3v2 tags at the top of the ogg files. WinVorbis/Vorbix will not currently open any files that contain this tag. WinVorbis/Vorbix does not fully support multiple stream Ogg files. Only comment tags in the first stream will be read, and all others will be deleted when the file is saved. Multiple stream files will also show an incorrect duration and average bitrate on the File Info tab. These files should be quite rare and only likely to come from capturing an OGG broadcast stream, or concatenating multiple ogg files. 1.63 Fixed: Would not open some WAV files. New: Updated OggEnc to auTuVb5.7 tunings for better sound quality. 1.62 New: Now supports reading APE v2 file tags within WAV files, as well as RIFF LIST/INFO chunk and Cart Chunk track information. New: Updated OggEnc to auTuVb5.5 tunings for better sound quality. 1.60 Fixed: Error when loading tracks using the Open Folder function more than once. Fixed: Progress bar not working when opening files with Open Folder. New: Updated OggEnc to auTuVr1 tunings for better sound quality. 1.57 New: Updated OggEnc.exe to Vorbis 1.1.1 and aoTuVb4 tunings for better sound quality. The Quality level now goes from -2 to 10 and displays the approximate bitrate for a stereo file. Minor cosmetic changes. 1.56 Fixed: Crashes during case changes. 1.56 Fixed: Form size fixes for large fonts. 1.55 New: Better handling of non-ascii character sets for upper/lower case conversion. 1.54 New: Updated to Vorbis tools v1.1.0, plus minor cosmetic changes to take advantage of Windows XP themes. 1.53 Fixed: Some comment fields were not resizing correctly. 1.52 New: The total number of tracks in an album may now be entered in each file. This uses a tag called TRACKTOTAL. 1.52 New: Non-numeric track numbers may now be entered, provided the new option Enforce Numeric Tracks is unchecked. 1.51 Fixed: A bug in the process priority meant that nothing would work (error messages) unless the encoding priority was set to Normal. 1.51 New: The User Defined Tags definition in the options can now be edited. Also, it now uses the tag editor so long tag values may be easily entered. 1.50 Fixed: The encoding progress bar should now function at all times. 1.50 New: Monkey's Audio files (.APE) are now supported as input files provided the file mac.exe exists in the WinVorbis folder. Download Lossless Codecs above and extract mac.exe. Requires the modified oggenc.exe included in the Setup. 1.50 New: "Open Files" and "Open Folders" will now append new files to the current file list and not close existing opened files. "Close" & "Close All" are new options on the File menu to close opened files. 1.50 New: Drag & drop from Windows Explorer onto the File Combobox is now supported. Multiple files and/or folders and subfolders containing supported file types will be opened. 1.40b Vorbix only. Version number fixed to show 1.40. Compiled under new compiler which requires different QT libraries. Download libborqt.tar.gz as per Vorbix Installation above. Other minor bugs fixed. 1.40 Fixed: Finally the IO error during encoding has been tracked down and fixed. 1.40 New: "Open Folder" option has been added. Available from the File menu or as the green folder toolbar. It will open all audio files in the selected folder & subfolders. 1.40 New: When loading directories (drag & drop or new context menu), an error will not be generated on non-audio files. 1.40 New: The Page Up/Page Down keys may now be used to display the previous/next track. 1.40 New: Minor changes: Hotkeys on the standard tags. Graphical previous/next track arrow keys. Larger template selection dialog. 1.36 New: Now accepts AIFF, AIFF/C and RAW file formats. The RAW files must be 16bit stereo PCM unless "additional encoder options" are specified. 1.36 New: Includes/supports VorbisGain v0.32. 1.36 New: Now permanently stores the last file type opened. 1.35 New: Vorbis tools v1.0 are now included/supported. Encoding Quality now supports the new level starting at -1. 1.35 New: "Additional Encoder Options" may now be entered in the Options. 1.35 New: The "Save All" button now changes to "Encode All" when loading WAV files. 1.34 Fixed: Case changing with file scan & file save templates was using the menu item selection rather than the options selection. 1.33 New: Linux version released as Vorbix. 1.33 New: A progress bar now shows the progress of the encoding process. 1.32 Fixed: Since v1.3, entering tag data when no files were opened could cause an exception error and disable the program. 1.31 Fixed: Tracks with double-quote characters (") in the single line edit boxes where causing a processing error and not tagging the files. 1.3 New: While encoding or decoding, the thread priority may now be set to Normal, Low, or Idle. 1.3 New: The <> Copy buttons will now be individually disabled when all loaded tracks contain the same data for each tag. This provides visual confirmation that a Copy is not required. 1.3 New: The Scan & Save templates now support additional tags. %g = Genre and %d = date. Also, user-defined tags may be used with the template codes %1, %2, .. %6. %1 relates to the first defined tag name in the Options. %2 relates to the 2nd defined tag etc. 1.3 New: The Track padding selection has been removed and is now activated in the file scan & file save templates where %n = Minimum digits, %N = 2 digits. 1.3 New: "Save spaces as underscores" has been added as an option. This replaces all spaces in the filename with underscores when saving files using a template. 1.3 Fixed: The encoding window was popping up on the screen when the app was minimized. 1.3 Fixed: Depending on the Windows regional settings, the Elapsed time on the Encoding window could show unusual times. 1.3 Fixed: The filename displayed on the Encoding window was being truncated on long filenames. 1.3 Fixed: The error "is not a valid integer value" when opening some files should now be fixed. 1.21 New/Fixed: "Pad Track# to 2 digits" didn't work! The option has been changed to a radio selection which only works for File Scanning. File Saving has been hard coded to pad the track number to 2 digits. The new track number conversion provides for None, Minimum digits, and 2 digits. 1.2 Fixed: ReplayGain was not being applied in Single/Radio mode to filenames containing spaces. 1.2 New: Added support for decoding OGG To WAV via the File menu. This option requires OggDec.exe which is included in the full install. 1.2 New: The "Advanced Tags" tab has been renamed to "Other Tags" and does not now display any "User Defined" tags. 1.2 New: Edit the Comment tag & User Defined tags in a large memo box by double-clicking on the Text box. This doesn't work for single line tags. 1.2 New: The Case Conversion tool button/menu item will now toggle between the changed & original value. 1.2 New: The Case Conversion tool button now has a dropdown list to quickly select a different case routine. This selection is reset to the Default Case routine (in Options) when the program is started. File scanning still uses the Default selection in Options. 1.2 New: option "Pad Track# to 2 digits". All single digit track numbers will be padded to 2 digits (eg. 01) when using file scanning & file saving. 1.2 New: The window size and position is now saved. 1.2 Fixed: Changing the name of a tag in the Advanced Tags would leave the original tag alone and create a new tag. 1.16 New: ReplayGain may now be added to Ogg files in either Single/Radio or Album/Audiophile modes. VorbisGain.exe must be available for this option, which is included in the full install. See replaygain.org for more info on ReplayGain. 1.16 New: A "Send To" shortcut to WinVorbis is now added when installing the full install. This allows multiple files or folders to be selected in Explorer and loaded in WinVorbis without using drag & drop. 1.15 New: "Auto template selection" checkbox option. When enabled and using file scanning, the program will choose the best template to use for each file. If no obvious template is found then the first template is used. 1.14 Fixed: Duration on the File Info tab showed unusual times with some regional settings. PLUS: Checkout the new Screenshots from WinXP. 1.13 Fixed: I inadvertantly introduced a bug in 1.12 (I think) where adding/editing a File Save Template would produce an error. 1.13 Fixed: Clicking the X Cancel button while encoding would close the form but continue encoding. It now cancels the encoding, same as the Abort button. 1.12 New: Case conversion options for Word Case, Sentence case, UPPERCASE and lowercase. 1.11 New: Retain comment tags when re-encoding! When loading WAV files, WinVorbis will read the tags of any existing Ogg files of the same name in the same folder. 1.11 Fixed: non-standard tags not being converted to UTF-8. 1.1 New: UTF-8 support added! Tag names may not contain UTF-8 characters, only tag data. Only the current codepage is supported. 1.03 Fixed: Well it turns out OggEnc does use Windows regional settings & requires a comma afterall (in those affected countries). 1.02 New: Case conversion added for file scanning & file saving. It is implemented in the templates by using uppercase codes, eg. %A, and also by a tool button/menu item which works on the field with the focus. 1.02 Fixed: Sorry, forgot to handle comma decimal separators as used in some countries. 1.01 New: Added ability to enter the encoding quality with decimal places. 1.0 New: Renamed from WinVC when encoding was added. (Not just a comment editor anymore). The Encode function is currently using OggEnc.exe and is unable to provide any indication of progress. 1.0 New: Double quote (") and equal (=) characters are now allowed in comments. This software is freeware and may be freely distributed. The author (including StationPlaylist.com) will not be responsible for any loss or damages resulting from the use of this software. The source (in Delphi5/Kylix2) is copyrighted (not open source) but is available on request for personal use only. 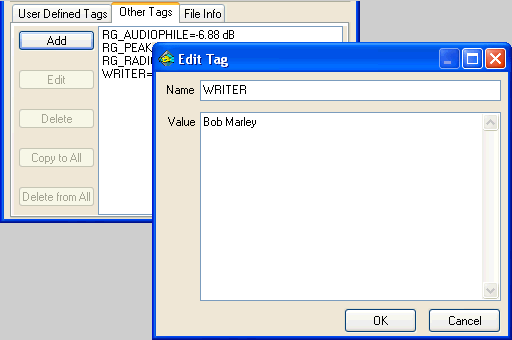 WinVorbis/Vorbix makes it easy to encode, enter and maintain tags for a whole CD. 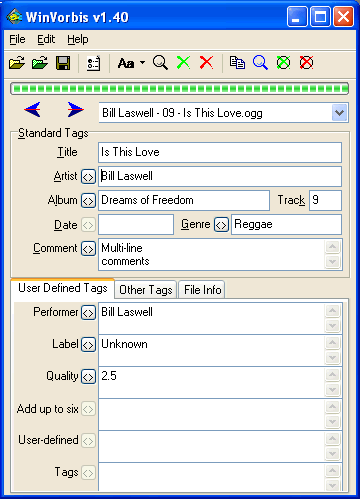 The same tags may be copied to all tracks easily without having to enter the text many times. Up to 6 user defined tags may be setup to make it easy to enter additional information. The Advanced tab provides the ability to view & maintain an unlimited number of non-standard tags. 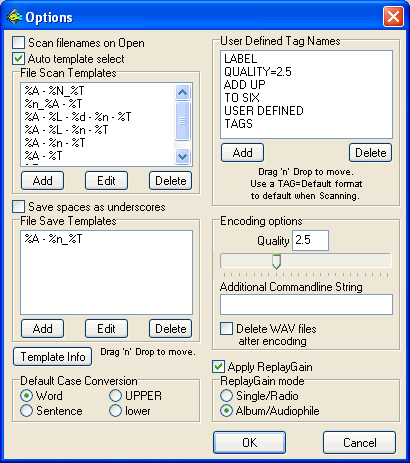 Multiple File Scan templates may be setup to create tags automatically based on the filename. Multiple File Save templates may also be created to rename the files when saved. Files may be opened by dragging files or folders from Windows Explorer onto the WinVorbis Icon (not supported in Vorbix). If folders are dragged, all subfolders are also recursed for OGG and WAV files. A "Send To" shortcut to WinVorbis is also available (if installed using the full install). Use the <> buttons to copy the comment text beside the button to all loaded tracks. On the Advanced Tags tab, the Copy To All button has the same effect on the selected tags. The Copy defined tags to All menu item/toolbar button will act as if every <> button was clicked. (ie) the currently displayed text, except the Title & Track, will be copied to all loaded tracks. This will only copy the Standard & User Defined tags (defined in Options). Use the Advanced tab to copy non-defined tags. Similarly, the Delete defined tags menu items/green X tool buttons, will only act on the defined tags. Use the Delete all tags menu items/red X tool buttons, to remove every comment tag. The Delete from All button on the Advanced tab will delete the selected tags from all loaded tracks, regardless of the value they contain. The User Defined Tag Names (in Options) may contain a default value which is activated when using the Scan feature. (eg.) QUALITY=4.5 will add a QUALITY tag to the User Defined tags and will default to a value of "4.5" when Scan or Scan All is activated. To load a tag name without a default, simply enter the tag without '=value'. eg. QUALITY. The Scan filenames on Open option will only use the first defined File Scan template unless Auto template selection is turned on. Auto template selection, when enabled and using file scanning, will choose the best template to use. If no obvious template is found then the first template is used. Comment tags are retained when re-encoding! When loading WAV files, WinVorbis/Vorbix will read the tags of any existing Ogg files of the same name in the same folder. Nothing physically happens to the files until they are saved, so if you make a big mistake, just re-load the files. Visit StationPlaylist.com for low-cost music scheduling, live assist and automation software for radio station broadcasting and internet streaming.